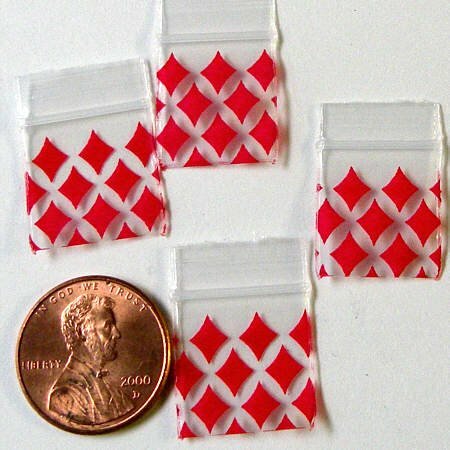 200 Apple® Brand Bags 5858, 5/8 x 5/8 inch reclosable 2.5 MIL thickness, Red Diamonds design, mini ziplock bags. The penny is only to show the size. Genuine Apple® brand bags: Top quality heavyweight bags, thicker and stronger than the 2 MIL bags offered by many other sellers. Many more bags in my eCRATER store. Free shipping of all products anywhere in the USA, including Alaska, Hawaii, Puerto Rico, Virgin Islands, Guam, and other US Territories and Possessions. 200 Swoosh Design Baggies 1515 Apple® Brand Bags 1.5 x 1.5 in. 200 Super Hero Design Baggies 125125 Apple® Brand Bags 1.25 x 1.25 in.